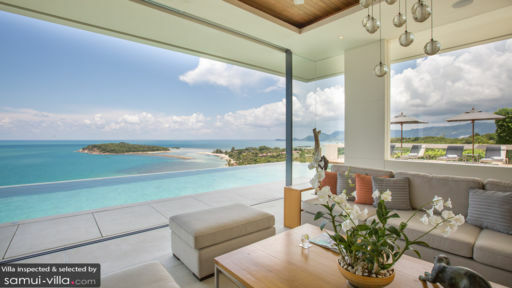 Villa Natha is a contemporary 5-star luxury villa, perched on a green hillside that overlooks the breathtaking coastline of Ko Samui in Thailand. This multi-level holiday retreat enjoys a top location for visiting the most popular hot spots of the island. The beach strip of Chaweng, with all of its shopping, dining and night-life, is just a short 10 minute drive away. 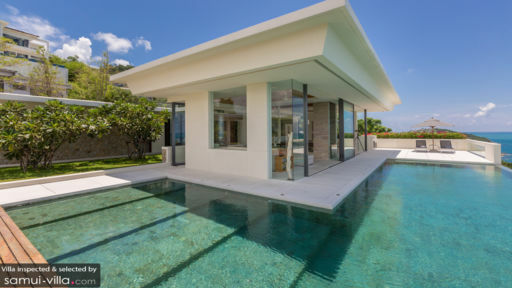 With 5 deluxe bedrooms, a cinema room, a glorious infinity pool and a highly trained Thai Chef on-site, Villa Natha will make you wildest dreams come true! Villa Natha houses not 1 but 2 master suites found on different levels within the estate. Both of these luxury rooms feature large king-size beds from where you can gaze at the ocean view in the morning. The rooms are also furnished with TVs with DVD-players for entertainment and large wardrobe closets. The en-suite bathrooms add to the all-round luxury feel with an outdoor and indoor shower, dual vanity and all bathroom guest amenities. The other three air-conditioned bedroom suites feature king or queen-size beds, TVs, generous wardrobes and private en-suites. All of the rooms enjoy the magical view over the ocean, providing everyone with the same enchanting experience after waking up in the morning and sliding open the curtains. 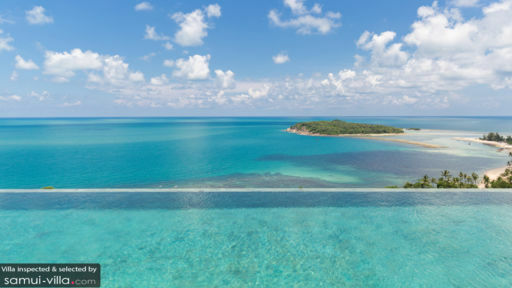 Magical views over the azure blue ocean and the Gulf of Siam will enchant you while lounging and tanning outdoors at villa Natha or swimming in the crystal waters of the infinity-edge pool that blends in seamlessly with the ocean view. For the kids, there is a shallow area where they can safely splash around under supervision and the manicured green grass lawn is also nice for them to play on. The sunny pool-deck makes a perfect spot for alfresco BBQ dinner parties or cocktail feasts in the afternoon. Full length glass doors slide open to the pool-deck, maximizing the ocean views and allowing natural sunlight to shine into the living room of villa Natha. The air-conditioned living room makes a great escape from Thailand's tropical temperatures. The villa enjoys a contemporary sleek white interior design enriched by a marble floor and wooden furniture. Dining and lounging to the view of the ocean is daily business here. For entertainment,there is a large comfy sofa where you can curl up together to watch a movie on the large television-set and for real state-of-the-art entertainment, there is a fully sound-proof, darkened cinema lounge with luxurious day-beds, a projector and screen and surround sound system. Alternatively, you can enjoy a work-out at the villa's private gym. The Thai chef cook does magic in the professional kitchen but there is also a guest kitchen that comes with a bar and stools for enjoying some tropical cocktails together. Highly trained staff will make your stay unforgettable and most pleasurable. There is personal butler service, daily housekeeping, and security. A baby-cot is available free of charge. Villa Natha is located within the Narayan Heights estate, perched on a tropical hillside that rolls down to a beautiful white-sanded beach on the east coast of Ko Samui. A short 10 minute drive brings you to Chaweng, the island's most popular beach town where you can go snorkeling and diving in the ocean, go out go dinner, shopping and go explore the happening night-life. Ko Samui's international airport is just a 10 minute drive away.